The pcProx 82 Series card reader integrates with existing ID badges for applications beyond door access. 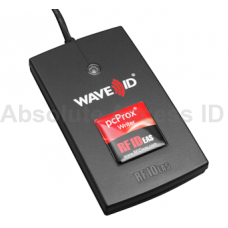 The pcProx 82 series card reader is designed for use with nearly all proximity, contactless and magnetic stripe cards. This card reader is ideal for employee log-on, time and attendance and point of sale transactions. This reader is new to the pcProx line and is a pcProx Nano designed to conveniently read 125kHz.